Hello Sweeties! I'm back again with another educational blog post regarding my Hydrating Skincare routine. I told you that I will try my best to do a complete post for you guys. You can use it as a reference and learn some basic knowledge / correct way to complete your skincare routine. So this is how I normally apply my skincare product and since I'm a big fan of Dr.Wu hydrating product (especially the toner , gel and mist), I decided to featured and introduced again the whole hydrating system for you! Yes, I did mentioned this on my blog before and i guess you guys were quite familiar with this brand. 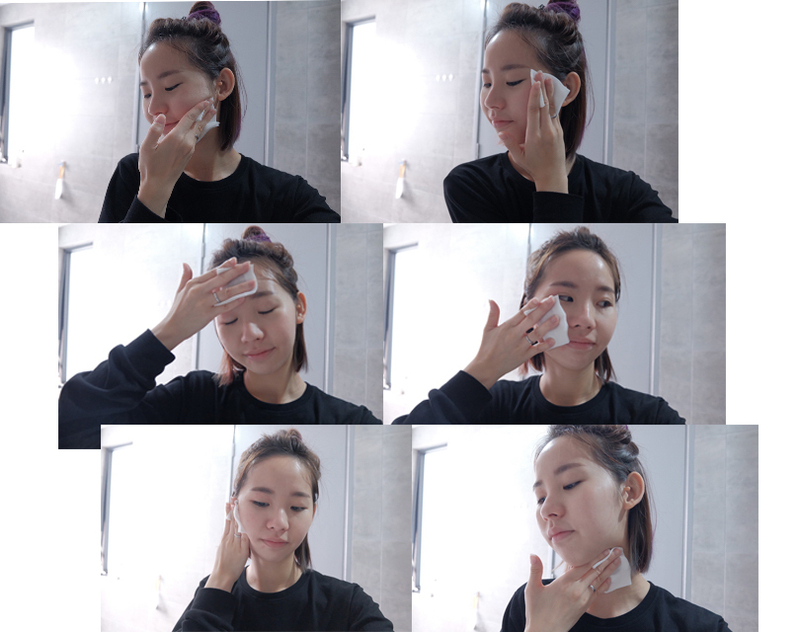 This time rather than just talk about the product, I will emphasise more on the texture, how to apply and what I did on my daily skincare routine. Since I always travel, I usually bring my hydrating skincare product with me. Whether it's a cold weather or a hot weather, I always found that Dr.Wu product can be really helpful to take a good care of my skin. Especially like this few years, I often get oily on my T-zone and dehydrated skin. I always thought that it's oily so I need to use something that is oil control, then ended up my skin become really dry. It doesn't help and soon, it turned really sensitive and at the same time during my trip to Taiwan last year, I noticed this clinical brand Dr.Wu. So it was a big twist for me, ever since I tried their toner and understand how these product works. I know there's only one solution for my skin. It's to keep my skin hydrated! Give enough 'water' and feed it well lol. When your skin is dehydrated, it gives a sign that your skin is lack or water cause it become really dry and at the same time oil activity can still be overactive in dehydrated skin. Even oily skin can experience dehydration too. So it's the reason why it's important to keep your skin hydrated. Like in my case, when I just back from a cold weather country, my skin turned out to be sensitive, dehydrated after I back to Malaysia. It's all because the changes on the weather and my daily lifestyle. So my dry and dehydrated skin start to experience irritation, itchiness and become so sensitive. Feel so tight on my skin each time I wash my face and the roughness on my skin. It's terrible. I guess some of you experience the same thing too, exposure to the sun causes water to evaporate from skin and sitting indoor with air-con can also dry out our skin. Then lastly, our skin become so so so so sensitive. Sometime we known this as外油内干 ／内油外干 skin type. It's all because of your dehydrated skin. So it's why you should consider getting a hydrating skincare routine first before consider others. It's always back to the basic when it come to the problem of your skin. Then, I also become really caution on trying other skincare product because you know you have only one face lol. For those who read this post How I take care of my skin 101 you probably knew it. Now, I'm so glad to collaborate with my favourite brand Dr.Wu to introduce and talk about the complete guide on its Hyalucomplex Hydrating System. Are you ready? Let's get started! Unlike others skincare brand, Dr.Wu is a clinical skincare products with technologically-advanced skincare line of high potency products specially design to treat your sensitive skin. For those who ask me to recommend some nice skincare product for hydrating one, this is always my answer. Started by using the toner and now I'm completely in love with the whole hydrating system like the gel (as a moisturiser which is no sticky and easily absorb into my skin) and also the mist. 😍😍 The best thing is, even after laser treatment skin, you still can use Dr.Wu hydrating product. This is how good it is even on super sensitive or damaged skin. For a better result, it's best to use the whole range as in each product is specially designed to complete the whole hydrating system and to hydrate your skin inside out. But if you are worry about it, you can get the toner and gel first and I dare you because you will definitely purchase more and more from the same range product again. HAHAHAHA Yes, I always ended up keep re-purchase the toner and gel wtf. Or if you followed my insta stories then you will noticed it. Targeted problems: Dryness , Skin imbalance , Damaged and Sensitive Skin. This whole range proved me the long-lasting hydration result. It maintain our hydration levels from inside out and all thanks to the fifth-generation HYALUCOMPLEX Hydrating System that penetrate deeply into our skin, moisture is locked in, replenished, retained, and activated to achieve the long-lasting hydrating effects. For your information, there are more products available for the whole series (and it's depend on each of your preferences.) For example for moisturiser I personally prefer gel type as it's more light and easy to apply for me. Some people prefer thicker lotion texturebut for me I think I prefer the all-in-one hydrating gel lol. So I will only introduce and recommend the one I'm using / really like it one for you. Now let me show you one by one! This post might be really long but hope it's helpful for you. As for my hydrating skincare routine, I will kickstart with the mist first because it's been my all time favourite product for more than half year now. This just replaced all my previous mist and a big win on how fine the mist is and its ultra-wide spray. You can be really shock with the size of this mist. It's really BIG and last me for months. It's really hard for me to capture how fine it is lol. Because most of the time you need to feel it yourself but just to show you guys how fine it is. I decided to take a photo with a darker background color. Look at this and if you want to spray on your face. Please make sure you take really far away because the ultra-wide angle spray is really ULTRA-WIDE!! Before applying makeup just to refresh my skin and locking in the moisture. There are only one drawback of this product, the size which I'm not able to bring with me when I'm oversea. If only Dr.Wu will came out with a smaller size then I'm sure I will be really happy but nvm, I still love it. After all this product really wins my heart! So guys, if you are looking for a mist, here's the right option for you. For sensitive skin or skin with itchiness / really dehydrated. I recommended you to try this gel cleanser. It's super duper gentle with its non-irritating texture. Let me show you the texture and how I apply the cleanser on my face. It's really gentle even sensitive or after laser / damaged skin can still use it. Compare to other cleanser, this is less foam and bubbles but really clean my skin and balance our skin pH level. Texture: Gel but after you mix with water and massage on your skin, it turned milky. #ChanwonTips: Always remember two key word which is Upward and Outward. Since I'm getting older lol, it's important to clean your skin upward & outward and I use this to remind my skin make sure it always stay up there, not dropping down lol. For circular motion also same like this. Just to make sure you gentle massage your skin and at the same time clean away all the dirt! Pour a 50 sen amount of the cleanser on your clean hand palm then mix with water or else you can wet your skin and apply the gel right away on your face. Gentle massage it upward / outward and circular movements all over your face. From central to outer corner of your face. Then you can see the gel start to turn milky. After all, rinse it away with warm water and lightly pat dry it. #ChanwonTips: Don't use your body towel / dirty towel to wipe your skin. Because there are lots of bacteria on your used towel. Imagine you use it on your body and use it away on your clean face lol. So please!!! Take note on this. Yay, my all time favourite product and I'm not sure this is my 4th or 5th bottle lol. Like a grandma talking to their grandchildren but really really like this. Unlike other toner this is a highly concentrated essence!! The texture is really diff from others. Let me show you!! It's a concentrated essence but when you spread it all over your skin, it's NOT greasy, thick and oily at all. Really impressed with this toner and remember to apply all over your face and neck. As usual, remember to apply it from inner to outer and upward too. Like this kind of essence texture toner I prefer to use it without cotton pad because I want my skin to fully absorb it and it can save your toner + easier for lazy girl like me 😝 But if people who want to exfoliate '去角质' like apply it on your neck too then you can use it on a cotton pad. So for toner, I will pour it on my hand and slightly 'warm it up' first and gently spread it all around on my face. Outward and upward!! Remember to apply on your neck area too. That's one of the mistake people do because they usually just skip it. After all just dab dab dab it until everything absorb into your skin. There is no right or wrong in either way. It's all depend on what you want! If you are really lazy, just use hand lol But remember to use exfoliating product once in a week. #ChanwonTips: So normally when I'm oversea if I feel my skin really dry in the morning (since I didn't bring this mist with me) before I start apply any makeup, I will use the Dr.Wu toner and pour a little on my 1/2 Japanese Cotton pad. Then, put it under my under eyes area + cheeks area. It will be act as my emergency SOS mask lol. Just put there for 5-8 mins before I start apply any makeup! This serum treat it as a repair tool for dehydrated skin. There are two type of serum for this range. A light version and the one i'm using is the normal version. The light version is more watery and oil-free texture while the one I'm using is just the texture is slightly different. As usual, very easy to absorb into our skin and the packaging is really easy to squeeze out. Normally serum need to pour but this one just squeeze the amount you want and apply it all over your face. Instead of using the cream I prefer something like gel. This gel is like the queen after the toner and mist! It's super duper light, fast absorb and really locked everything inside our skin and make sure it's hydrated! This hydrating gel is like the all-in-one time minimising skincare concept and I guess no one else could resist this because it's suitable for busy people or lazy girl like me. HAHAHAHA It unique gel-type really melted my heart. It's like a gel but once you spread it around, it turned into water-like texture. People who always on the go will like it. For this since the texture is really nice and light, I just apply the product dot-dot-dot all over my skin (dot dot dot style lol) and after that just spread it all over using my fingers and right away you can see it absorb into our skin really quickly. Wooohooooo That complete my whole skincare routine!! Ps: If your skin really super duper dry, you can continue with the hydrating cream. After my Krabi and Boracay Trip, my skin become extremely dark especially my forehead. lol I wonder why forehead is totally 2 tone darker from my overall skin tone lol. So when I post about the Dr.Wu product you guys told me to try the Capsule Mask too. So it's my first time using their instant whitening capsule mask and soothing moisture capsule mask too. Sorry that I used everything and left only with the plastic paper to show you guys lol. What so special about this was you only use it for 10-15 mins and it is free from alcohol, fragrances, no additives / preservatives , without paragons and suitable for extremely sensitive skin. Can be act as a SOS mask in the morning and before you sleep too. So far right after I use the mask, I can feel that my skin has the lasting effects with just only one use. I guess it's because the ingredient penetrate the skin deeply , the mask cover every inch of my skin and keep it hydrated. It's suitable for everyone and specially helps for those who are having sensitive skin with extremely dehydrated skin condition. So if you are looking for a good alternative on your hydrating skincare routine then please try this out. I'm really confident with Dr.Wu product and hope there are more Dr.Wu product available in Malaysia. That's all about my sharing and review. Hope this is useful for you! Will continue spread my love to all of you! HAHAHA That's all for today and see you on my next post. Love, xoxo. Have u tried the deep hydrating capsule mask? (dark blue color)?the soothing moisture or deep hydrating is giving more hydration to skin? Thank you so much for such a detailed review for Dr. Wu’s product! I’m planning to buy it and your post definitely the best review! No worries <3 Hope this is useful for you! Please try the toner!! May I know when did you apply moisturizer? right after serum or before serum? can i skip the serum and just apply the gel after toner ?